A lot goes into creating a home studio. You’ve got to select your production platform, place your monitors and treat your room and only then can you think about connecting everything together and firing it all up! But just before then, you’ll be reaching for the final link in your home studio chain…cables. Ok, so cables aren’t the most glamorous aspect of production but I can guarantee you that the wonderful world of audio cables is more exciting and interesting than you think. Cables obviously come in a huge range of shapes, sizes, and colors but most importantly, they’re absolutely vital for any home studio, musician or DJ. Also, how much time has been wasted by musicians, producers, and DJs who don’t have the correct working cables? Way too much…! Don’t be one of them. Check out this extensive guide to cabling to really bulletproof your cable knowledge for now and the future. Why is Cable Knowledge Important? Being that guy or girl who knows their cables is a great asset in the music world. If you’re a producer in a studio, you’ll never be without the right cable for any studio work. You’ll also reduce your risk of damaging any equipment. If you’re a DJ, you can travel with your own backup cables and know what goes where and when. Extremely useful if there’s a technical hitch or you need to help set up. We’ve all heard of digital and analog but what does it mean in cable terms? Analog cables include most of your usual audio cables including XLRs, jacks (TRS and TS) and RCAs. Analog cables transmit electrical signals that are essentially shaped like soundwaves. So, an electrical signal of a sine wave sent along an analog cable would loosely look like the diagram below. The electrical signal is analogous to the sound wave itself. Mic level – Balanced – Microphones transmit relatively small electrical signals and that’s why we have to use pre-amps to boost them to a level suitable for recording. They are the weakest of the 4 signals by a significant margin. Instrument level – Unbalanced – Instrument cables include the standard guitar cable which goes straight into an amplifier. They are somewhere between mic and line level in signal strength. Line level – Balanced or unbalanced – Line level could be considered the ‘standard’ level for modern audio equipment. Something like a Pioneer CDJ deck is line level, as are TVs, DVD players and a whole host of other digital equipment. Signals are boosted to line level so they can be recorded within DAWs. Line level is roughly 1000 times stronger than mic level. Speaker level and higher – Unbalanced – Some cables are used to carry much higher voltages (e.g. speaker wires running from amps). These feature signals above way line level. There’s no need to balance cables that are carrying voltages this high. Unbalanced cables pick up noise along the cable run. It’s just a wire after all, so it’s not ideally shielded from interference caused by other electrical fields nearby (e.g. a mains socket). Guitar leads are still unbalanced though and you might now be asking why?! Back when audio gear was first being developed, the unbalanced jack didn’t exist and therefore, instruments like guitars and their amps were built to accept unbalanced jack cables. Associated noise has become part of the character of the instrument plus with pickup noise, etc, cable noise becomes pretty insignificant. As mentioned, the TS cable is an unbalanced cable and is used for guitars and bass guitars amongst other electronic instruments. Balanced cables are not suitable because of impedance issues and the fact that guitar equipment only accepts high impedance unbalanced mono inputs. TS actually stands for tip and sleeve, which refers to the fact that an unbalanced cable contains just the signal (tip) and ground wire (sleeve). It’s important to remember that TS and TRS refer to the cable’s format and wiring, not the thickness of the wires. Regardless of whether you use TS or TRS, it’s especially important to power decent sized PA speakers with heavy gauge leads. The RCA cable is used most frequently for connecting stereos or turntables. They are unbalanced but are color paired for stereo applications. They’re capable of carrying line level signals. An RCA would be used to plug a turntable into the input of a mixer, phono for turntables and line for CDJs. Turntables produce a weak voltage, much weaker than line level. The Speakon cable has become ubiquitous for pro audio and large sound systems. It’s an unbalanced analog speaker cable that is capable of carrying ultra-high currents. When the currents are that high, there is no point in balancing the cable from small interferences like radio noise – better to make the wire heavier gauge instead. The XLR is certainly one of the most famous audio cables in the world. It’s a balanced three-prong cable with a positive, negative and ground wire. XLR cables are used to connect microphones and speakers as well as all manner of audio devices like amps, FX, etc. XLRs sometimes features a clip which prevents them from being pulled out from equipment accidentally. Is there a difference between speaker XLRs and microphone XLRs? XLRs for speakers are much thicker gauge and can handle higher currents. XLRs for microphones are thinner and cheaper as they don’t need to carry high currents. If you choose the wrong XLR cable then you could damage your equipment or even pose a fire hazard. Fortunately, these days, XLR outputs from power amps to speakers are rare. If you’re running an output to powered monitors (like some KRKs) then mic XLRs are just fine (as the powered speakers just run at standard line level). Whilst a noisy guitar isn’t necessarily a bad thing, you really don’t want to be faced with a noisy mic or other line-level cable and therefore, these cables should be balanced when possible. When a signal passes through a balanced lead, they’re initially inverted before being folded back in onto each other to form one output signal. Once the signals are recombined, the noise is canceled out through polarity inversion, much the same as in phase cancellation. 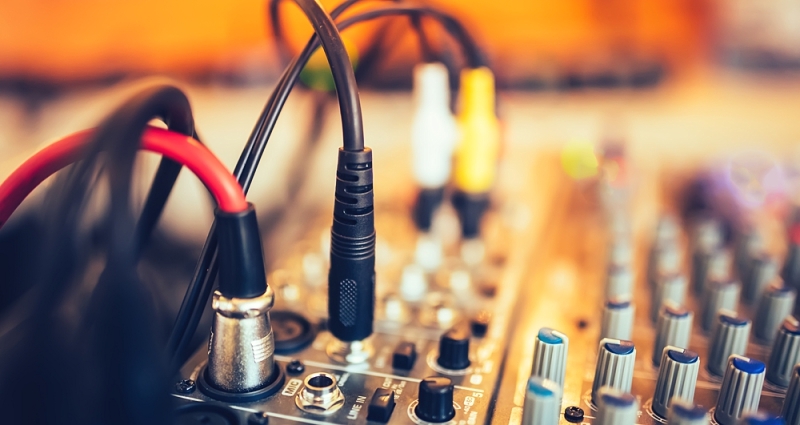 Whilst balanced cables are vital for microphone level signals which are very weak and prone to noise, they tend to be suggested as a solution for all cabling. This is not the case. However, whilst balanced cables used to be fairly rare, they’re now extremely common in numerous audio applications and are more durable than they were previously. TS are TRS are often confused and you can see why! At the end of the day, they’re actually very similar and in the most home studios, you can use either. Don’t overthink the differences between TS and TRS. Obviously you need to use TS for guitars but otherwise, they are very similar and have very similar uses. Just because a TRS cable is ‘balanced’ doesn’t make it better for everything. It only really lends an advantage over the TS when carrying low-level signals for fair distances or in environments with lots of electrical noise. TRS cables are more expensive and more fragile than TS cables. TS cables can be noisy over long distances. They’re the only option for guitar and basses and if you connect a guitar to an amp with a balanced TRS then you’ll lose half the level as the hardware is only designed to handle an unbalanced mono signal. Aside from that, TS cables are way more durable than TRS as they feature just one big wire! The TRS lead is the balanced version of the standard TS guitar lead. TRS stands for tip, ring, sleeve, meaning it has two wires and a ground wire. The TRS lead is capable of carrying signals for hundreds of yards without interference and due to the low voltage of a microphone, this can mean the difference between a quiet and noisy output. The good thing about digital cables is that choosing the right one for the job is easy! Also, you’re not going to damage your stuff by using the wrong digital cable. There are no cable thickness issues, etc. The bad thing is that they change as manufacturers move onto the ‘next best thing’. For example, Apple created Thunderbolt when many interfaces were running on Firewire. So, analog cables carry an electrical wire that is analogous to a waveform, e.g, a sine wave, whereas a digital cable carries the waveform in data packets known as ‘bits’. Here you can see how an analog wave is digitally sampled into sections for transmission along a digital cable. A digital system, like a DAW, can interpret this data and use it to make sense of the analog signal. They all essentially do the same thing – carry data. Thunderbolt is by far the quickest cable used in consumer audio today. With a tremendous theoretical max transfer rate of 10GB/s, it’s very unlikely that studios will need anything more powerful for the foreseeable future. MIDI cables are capable of carrying specific audio data on things like notes and velocity. Many producers today have never actually seen a MIDI cable as they’ve been all but completely replaced by the USB cable which now runs from most ‘MIDI’ keyboards to your PC. Optical cables, light pipes or fiber optics use light to carry digital data. They actually flash intermittently in different patterns to communicate audio – pretty awesome! Fiber optics are also used in high-speed internet. ADAT: ADAT cables can carry up to 8 channels of audio at 44.1 or 48kHz. Some audio interfaces like the Focusrite Scarlett range have an ADAT connection for the simple addition of 8 extra channels. S/PDIF: This can carry two channels of audio and is less common. These cables are also used for connecting your internet router to other home devices like an Xbox or TV set. Also named ethernet cables, they are capable of carrying lots of audio channels – up to 40 in some circumstances – at extremely low latency and over long distances. Cat5e cables are used in many high-end studios which make use of large multi-channel interfaces. So, if instrument level guitar leads are below line level and you need line level for recording then how do you record guitars? A DI box’s principle is sort of the same as a pre-amp. It boosts a signal to line level for recording. Using a DI box also allows you to convert a guitar’s unbalanced signal into a balanced one for output along a long XLR cable. You can plug a guitar into a DI input and then feed one output into an amp and one into your interface with an XLR. This enables you to record both your amp with a microphone and a direct line level signal from your guitar. Cable management is a serious thing! In the studio, coiling your cables up properly will prolong their life considerably. On stage, cable management prevents accidents and cables from getting yanked out of equipment. You don’t want the sound man yelling at you because he tripped up from your dodgy wiring! Cables constantly grow and evolve to accommodate for new gear and equipment. Over time, we’ve seen tons of new cables enter the market to provide more and more powerful audio solutions for live and studio scenarios. Audio cables are extremely diverse and the more you learn, the more you may realize that you never knew. Knowing what cable to select and when is vital for any producer or musician – it could even prevent equipment damage or at worst, fire. Aside from that, cables are a requirement for your home studio, so once you’ve finished your home studio, there’s just one thing left to do…get cabling!